Not too long ago Bell's Brewery, Inc. (hailing from That State Up North) got into some hot water with Innovation Brewing (of South Carolina). From what I gathered Bell's didn't like Innovation's name (Bell's had a bumper sticker that said "innovation" (or something of the sort) years and years ago. Anyway, I had heard that lawyers were involved. And then, like magic, I heard nothing else about it. I'm sure a quick google search would turn up more info, but I don't really care. As far as this all concerns me is as follows: I boycotted Bell's for a bit. 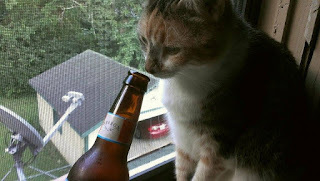 But, eventually, I decided that I like their beer too much to care about something of which I'm only really half sure (I've had different people involved tell me different things). What this means is that today I'm able to sit here with a clean conscience and enjoy the bottle of Oberon before me. Bell's' story begins back (before I was born) in 1983. The company was originally a homebrew supply store. Two years later, however, Larry Bell sold his first commercial beer. It was brewed in a soup kettle that held fifteen gallons. Jump forward twenty years and Bell's now distributes their brews to twenty states, DC, and Puerto Rico (Which makes the first twenty [twenty-two, depending on how you're viewing it] years of my existence seem pretty paltry in comparison; I hadn't even earned a bachelors degree at that point). 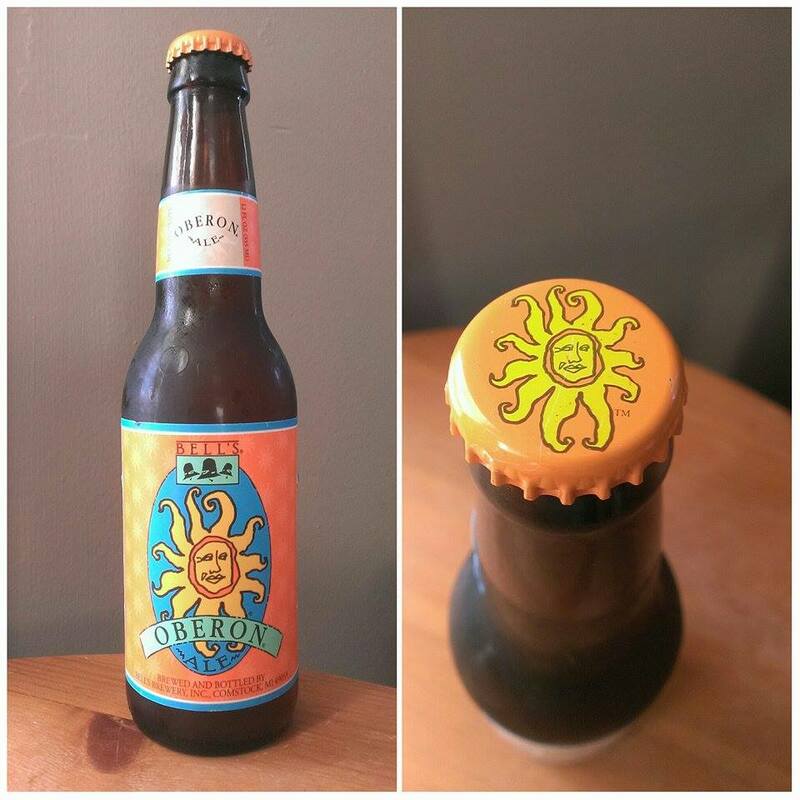 I've discovered that Oberon is Bell's most well-known brew. Is it their best? Nope. But it's also not as overrated as some people think. On the official page for the brew, the brewery calls Oberon "...a classic summer beer" and attributes this to its "...smooth mouthfeel..." and mixture of "...spicy hop character with mildly fruity aromas." The page also informs that the ale is 5.8% ABV and is available from March until Labor Day. There is some fruitiness in the aroma, so Bell's' description nailed that. It's citrusy, not sweet like strawberries or grapes. Could you attribute that to Oberon being a wheat ale? Yes, but I like it. Purrl doesn't, though. At three whiffs she'll most likely be staying away from the beer. The flavor is crisp with a slight bite. It's nice and simple. I can't really taste the ale because I'm too focused on Oberon's mouthfeel. I wouldn't necessarily call it smooth. Creamy is a better fit. It has that full, easily downable quality that the best wheat beers have. When my grandmother passed away my senior year of college, I was devastated (although I did a pretty good job at hiding it from my friends). I made the (relatively short) trek up to Michigan with my parents and brother for her wake and funeral. I shouldn't have to say that it was a very somber affair. It got less so after the funeral when we celebrated her life at my Aunt and Uncle's house. Oberon helped us in doing so. That's the memory with which I associate Oberon; not a summer's day but chilly, sunny April afternoon. Is Oberon great? It's more good. The flavor is underwhelming but it's aroma and mouthfeel are the tops. Should you drink it? Is it summer where you are? Or are you celebrating the life of a loved one? If so, then, yes. Yes you should. This wouldn't make for a good fall/winter brew. I'm giving it a 7.5/10. Not awful (not overrated). Good. Drinkable. Purchase-worthy.